This page presents a simple sequence of creating a basic drawing, from a blank document to a printed design. It assumes that you have installed LibreCAD and have opened it to a new default blank drawing. It introduces quite a few LibreCAD concepts, and links to other pages that explain these. You can download and unzip File:Carport.zip to compare your results with what the authors of this document saved. The first part of any design is a freehand sketch on paper. This is quick and simple and so allows for greatest freedom in the design process. We'd like to create a drawing of the following alumnium structure which sits on top of a carport. For this example the background color has been changed to "white"
Reopen the file and close the "unnamed document 1" by clicking the circled x in the tab. We'd like to have an A4 drawing on which a scaled version of the 5000 x 1300 mm construction fits. A4 is 297 x 210 mm so if we make the 5000 mm be shown as a 250 mm long line we'd be set. That is a 1:20 scale. Via the menu Options/Current Drawing Preferences/Dimensions we can set the General Scale to 20 to achieve the scaling. And set Landscape for the paper direction. The first lines of any technical drawing are the construction lines, setting out the locations of all lines without specifying any line types, colours, etc. All straight construction lines are of 'infinite' length — i.e. they extend off the screen in both directions. Create a new Construction layer by clicking the "+" sign in the Layer list. 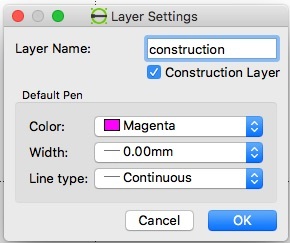 The new layer might have a name such as 'construction', and a colour of magenta or cyan or similar. The line's width should be '0'. Make sure Snap on grid is enabled. We'd like to create a 5000 x 1300 mm construction line drawing box in which our construction will be placed. Since we want precise positions for this box we'll use the Command Line Mode and create a Polyline. and shift the coordinates by 40 mm accordingly. Should you have made a typing error you might want to use the "undo" command to remove the latest drawing item that didn't go as you intended. You'll find a saved version up to this step in the file File:CarportEastStep1.dxf or in the zip file mentioned above. To support the transition from the free hand sketch to the LibreCAD CAD drawing you can optionally insert a scanned version of your freehand drawing as an image. For a triangle to be calculated we need three values. 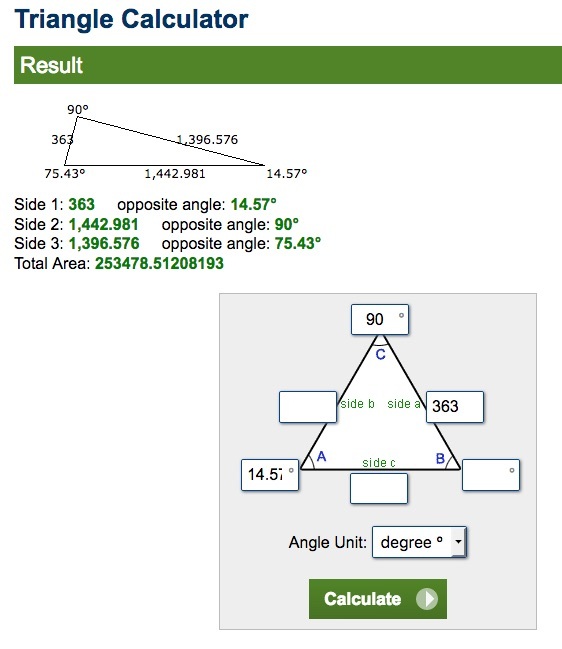 The values are from the triangle calculator. it leaves at an angle of 75.43 which we have to enter anti-clock wise with makes it 104.57 (90 degrees more than the frames 14.57 angle) the new point is to be calculated relatively so we have used the @ symbol to denote this, the < symbol denotes that we are specifing a polar coordinate. You'll find a saved version up to this step in the file CarportEastStep2.dxf in the zip file mentioned above. For the beams we could now also calculate the points for the corresponding polygons. 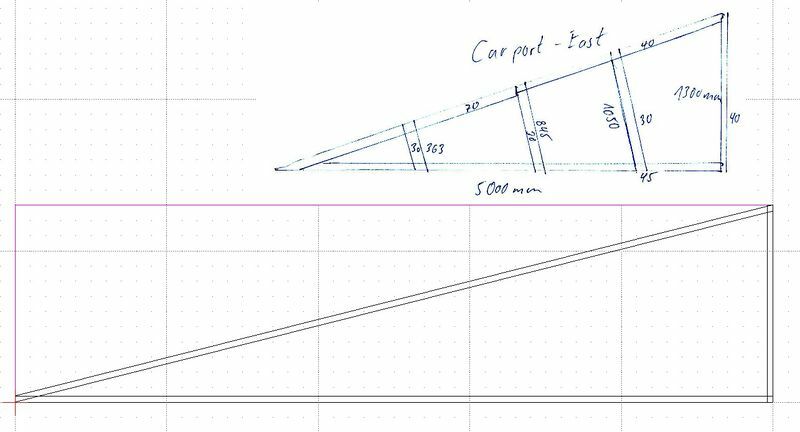 We do not need that much precision here so an alternative is to draw the beams with the mouse using our construction triangles as guiding lines. 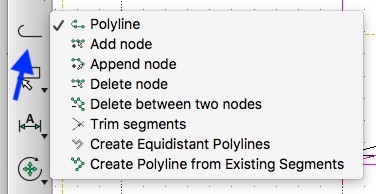 click "Close" in the tool option bar to complete the beam polyline back to the origin. The basic construction elements are now in place. You'll find a saved version up to this step in the file CarportEastStep3.dxf in the zip file mentioned above. You'll find a saved version up to this step in the file CarportEastStep4.dxf in the zip file mentioned above. This page was last modified on 1 March 2019, at 06:12. This page has been accessed 38,328 times.